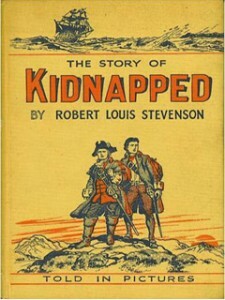 Kidnapped is set in Scotland just after the Jacobite rebellions and is narrated by the teenager David Balfour. The recently orphaned David leaves rural Essendean to seek his fortune with his relatives, the Balfours of the House of Shaws. He meets his uncle Ebenezer and immediately suspects the shifty and miserly man of trying to avoid giving David his due inheritance. His suspicions are confirmed when his uncle sends him up a ruined stair-tower in the dark, intending David to plunge to his death. Before David can confront his uncle, Ransome, the cabin-boy for the brig Covenant arrives with a message for Ebenezer from Captain Hoseason concerning their joint venture. Ebenezer decides to go to the Hawe’s Inn at Queen’s Ferry to resolve the matter. David follows in the hope of speaking to a lawyer, Mr. Rankeillor. There, David learns rumours that Ebenezer murdered David’s father Alexander, for the Shaw estate. While David knows the allegations are false, he cannot fathom how Ebenezer came to hold the estate. Despite some misgivings, David is delighted when he is invited to tour the Covenant. Suddenly sensing foul play, he shouts for help and is knocked unconscious – he has been kidnapped! Realizing Ebenezer means to cheat him of his rightful inheritance, David learns from the ship’s crew that he is to be sold into slavery in the Carolina plantations. David is not mistreated on board the Covenant, but he is horrified by the first mate, Mr Shuan, who in a drunken rage beats Ransome to death. At Cape Wrath, the ship runs a boat under. The sole survivor, Alan Breck Stewart, a Jacobite, “a condemned rebel, and a deserter, and a man of the French Kings” (p. 157) comes aboard. Concerned that having a Jacobite on board could be considered treasonous, Hoseason and the men plot against him. David, however, admires Alan and chooses to take his side. After a fierce attack, Hoseason agrees to take Alan to Linnhe Loch. Alan, a vain and emotional man, takes a shine to David, despite the fact that he is a Whig and loyal to King George. He gives him a button from his highly-prized jacket, telling him this proves to anyone that he is Alan’s friend. Alan tells David that he supports the Stewart clan of Appin and explains some of the clan’s history and struggles: the tenants of Appin pay rent to King George, but also to their chief Ardshiel. This rent is managed by Ardshiel’s half-brother James Stewart. The Stewart enemy is a Campbell, Colin Roy of Glenure, or “the Red Fox”, appointed factor by the government over the Stewart lands. Hoseason now asks Alan to help steer the ship through the difficult waters. The Covenant strikes a reef and goes under, and David is swept ashore on an island near the coast. He freezes, starves and is sick before discovering the Isle of Earridh is a tidal islet – he could have walked to shore all along! When he reaches shore, he finds that Alan has also survived the wreck and has left word for David to follow him. David now meets with many adventures en route to finding Alan. For example, his guide draws a knife on him, the dangerous and blind catechist Duncan Mackiegh threatens him and he sees an emigrant ship full of mournful people bound for the American colonies. David comes across the Red Fox himself when a shot rings out and he falls dead. David runs after the murderer, but the Red Fox’s men believe that he is an accomplice and give chase. Alan appears and helps David to escape. Alan quickly assures David of his innocence, but both must now flee as they are wanted men. They stop at James Stewart’s house, where everyone is preparing for the worst, since the family are known enemies of the Red Fox. To save them, David and Alan agree to let James take papers out against them, giving their descriptions as the murderers of the Red Fox. They flee once more, and meet with several adventures and many hardships along the way: they learn that James is in prison for complicity in the murder, they hide with Chief Cluny Macpherson, and Alan gambles away all of David’s money. David also falls ill and recovers in Balquihidder where he and Alan meet with Robin Oig, Rob Roy’s son. At last, they return to Queen’s Ferry where David tells Rankeillor all about his adventures. Rankeillor then tells David his family history: when his father Alexander and Ebenezer were young, they both fell in love with the same woman. When she chose Alexander, Ebenezer made such a fuss that Alexander gave him the estate so that he in turn could marry the woman he loved. Rankeillor and David concoct a plan to deceive Ebenezer, and they hide as Alan knocks on Ebenezer’s door, claiming to be Hoseason’s accomplice. Alan tricks Ebenezer into confessing to the kidnapping, and Rankeillor then reveals himself. Unwilling for the scandal to be made public, Ebenezer agrees to give David two-thirds of the yearly income of the Shaws. David now promises to help Alan to escape and to help James if he can. He and Alan part ways, and David realizes how much he cherishes their friendship: “I felt so lost and lonesome, that I could have found it in my heart to sit down by the dyke, and cry and weep like any baby” (p. 306). The Jacobite Rebellions were a series of uprisings occurring between 1688 and 1746 in which rebels fought to reinstate the House of Stewart to the throne after they were deposed in 1688 in favour of Mary II and William of Orange. The Jacobites continued to fight to crown a descendant of the House of Stewart until their final defeat at the Battle of Culloden, in 1746. When Colin Campbell, “the Red Fox”, and government factor over Stewart lands was murdered in 1752 in Appin, a certain Alan Breck Stewart was the chief suspect, although the real murderer is still unknown. However, when Alan escaped, James Stewart, the Stewart chief’s half-brother, was tried, convicted and hung for the crime. Quotations taken from Kidnapped, The Works of Robert Louis Stevenson, Swanston edn, vol x (London: Chatto and Windus, 1911).